Still not enough rain in my part of the Ozarks to enjoy any river paddling. My schedule has been too hectic to get out much these days anyway. I hope you have been enjoying the mild temperatures. I got out on Grave Creek yesterday afternoon for some much needed recreational paddling. Like most spots, Grave Creek is very low this Fall. However, there is enough water to paddle upstream a ways and Grave Creek always offers water enough to paddle down to Lake Eufaula from the boat ramp. It was a windy afternoon, but Grave Creek is pretty well sheltered from the wind. The fish were very active and several groups of folks were out pursuing a fish dinner. Since Dianne was stuck at home with Dylan (both have beeen sick with a cold all week), I didn't bother to try any fishing. I just enjoyed a lovely evening of flatwater paddling, no permit required. Although the totally clear skies made for a lackluster sunset, the curvy nature of the creek means there are many spots where the light filters through the treetops in a way that pleases me. For whitewater adventures, it looks like I will have to settle for my favorite Kayaking DVD's this season. During the cold season, I enjoy the exotic locations and fun soundrtrack music of both whitewater kayaking movies & kayak fishing DVD's. In fact, the local heros from the Arkansas Canoe Club offer a cool whitewater kayaking flick called ARKAYAKANSAS. Check it out in the online store on their website: http://www.arkansascanoeclub.com. I've watched it many times and I think the Arkansas whitewater footage is pretty awesome. I got to meet some of the kayak fishing enthusiasts from the Tulsa area this Sunday. Several of the Oklahoma Flatwater Paddlers (OFP) had planned to test their skills at Okmulgee State Park. I met up with about half a dozen NE Oklahoma area paddlers at 6:30am at the Hickory Point Campground in Okmulgee State Park. Okmulgee's two lakes are a popular destination for Oklahoma kayakers due to the lovely scenery, the wildlife and the lack of city permit requirements for boaters. For launching kayaks and camping, I prefer Clovis Point on Dripping Springs Lake and Hickory Point on Lake Okmulgee. Both lakes have clean water, good camping facilities and fishing for crappie, bass and catfish. As usual Dianne did all of the fishing, while I shot the sunrise and 'shot the bull' with the other paddlers. Dianne caught several small Bass and I got to see two osprey splashing down on the surface of the lake as they worked toward the same goal. I got some pictures of the Osprey, but the quality is pretty crappy as we had low light and they were much too far away for the 12X zoom on my camera. Herons and crows and such will pass over head occasionally, but eagles and osprey circle high in the sky, then they hover and then drop suddenly to the surface of the water with a tremendous splash. Amazingly they fly off with a fish between their toes without even buying bait! If you have a better camera and want to get a picture of an Osprey flying away with a fish, here's what you do. First, buy a kayak. Then, launch your kayak at the Hickory Point Campground boat ramp as early as possible and paddle, quiet as a mouse, left toward Salt Creek. Keep your eye on the sky and look for large birds hunting. If you see birds hunting sit still and get your camera ready for Sports mode shooting that will freeze the action using a ISO. About half a mile up Okmulgee Lake from the boat ramp, you should start seeing a large patch of weeds in the lake just before the entrance to Salt Creek. This shallow water portion of the lake is popular with birds that eat fish. Find a shady spot and sit still in your kayak. Watch the skies and you should see some of the amazing hunters at work. One of my favorite things about kayaker meet-ups with the OFP is the chance to see what kind of gear the other paddlers purchase. Since the group was made up mostly of fishermen, the majority of the kayaks were Sit-On-Top kayaks fitted with many upgrades and sporting at least three fishing poles per kayak. I saw a Wilderness Systems Pungo & Tarpon, an Ocean Kayak Prowler, and even a couple of those new Ascent SOT kayaks. This was my first time meeting most of the folks on the trip. Big thanks to everyone who made the trip to Okmulgee. I hope to kayak with you folks again soon! Dianne and I went kayaking at Sardis Lake, near Clayton, Oklahoma this weekend. Although this was my first visit, I think Sardis is one of the most beautiful lakes in Oklahoma. It has very clear, cold water a rocky bottom and it is surrounded by heavily forested hills of hardwood and pine. I wanted to visit Lake Sardis soon, as the future of this lake is very much in jeopardy. Oklahoma City has agreed to pay $27 million to acquire the water storage rights by paying off the debt owed by the state of Oklahoma to the Army Corps of Engineers who built the lake in the early 1970's. Local residents enjoy this lovely lake, so they are trying to preserve it. See www.ORWP.net for more info on the water dispute. You know what they say: 'whiskey is for drinking, water is for fighting'. In fact, the Choctaw and Chickasaw tribes offered to pay the $5.2 million installment payment that was due by July 1 of this year, but that offer was rejected. The Oklahoma Water Resources Board then signed a contract to sell the storage rights at Sardis Lake to the Oklahoma City Water Utilities Trust. Located in the Ouachita Mountain Range, Sardis Lake is so lovely that turning it into OKC tap water seems a bit short-sighted once you have camped here. For our visit, we camped at Sardis Cove campground. The camp host was very helpful and the outhouse-style restrooms were the cleanest I have seen in quite sometime. The clouds of disgusting insects that plague most campsite restrooms were nowhere to be seen! We chose Sardis Cove campground because it is on the more shallow side of the lake. Boats tend to run slower here to avoid submerged trees and The Narrows, a shady, curvy bit of the lake, is much closer than the more crowded campgrounds and boat ramps at nearby Potato Hills on Highway 2. Good fishing, camping and scenic paddling make Lake Sardis an obvious choice for kayakers eager to experience Kiamichi Country before it is transformed into a hilly desert. Kayaking the Illinois River is Back! With a water level well over four feet, The Illinois River in Tahlequah Oklahoma offered some great kayaking this weekend. Dianne and I had recently spotted the Hmong Cafe around 31st & Garnet and we had been curious about Hmong cuisine since we saw Gran Torino. I mentioned to Dianne that since we were going all the way to Tulsa, we may as well hit the Illinois River in Tahlequah afterwards. OK, it isn't exactly right on the way but she reluctantly agreed anyway. Recent rains left the water more green than clear, but running fast. We had fun and we both tried out new Paddling PFD's. The full trip report for our latest Illinois River kayaking trip, including our visit to the Hmong Cafe, in Tulsa is on our Illinois River page. The annual Outdoors expo is coming up, so Dave Lindo at OKC Kayak is looking for folks to volunteer to help with the kayak demo pool. It is a fun event to participate in, great folks to work with and it is all for a good cause. 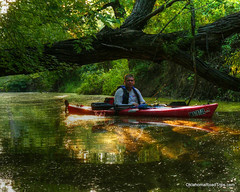 I'm hoping to join up with some of the Oklahoma Flatwater Paddlers for kayaking at Okmulgee Lake on September 19, 2010. If you happen to be camping at Okmulgee State Park this weekend I want to let you know that the Nuyaka Creek Winery Wine Festival is going on Saturday, September 18. Did you hit the water this weekend? Fall Kayaking is the Best! The water levels are rising and the weekend forecast calls for low winds and temps less than 90 degrees! It would appear that the Fall paddling season is ready to begin. Fall is my favorite season for kayaking around the Ozarks. I enjoy the faster water for paddling combined with the color changes in the trees. You will also find mmuch less traffic at popular kayaking destinations like the Elk River in Noel, MO or the Kings River near Eureka Springs, Arkansas. The mighty Mulberry River in Ozark Arkansas is too high for paddling now, but keep an eye on it as it should start falling soon. I don't know where I will be putting my kayak in this weekend, but I like the looks of The Kings River level today. On Sunday, September 19 some of the Oklahoma Flatwater Paddlers are meeting at Okmulgee Lake. I hope/plan to head out there and paddle Salt Creek with some of the gang. You should grab a kayak and join in! The Illinois River was rather low when I wrote this posting, but the forecast is for it to rise very fast. Watch out for downed Willow trees, if you paddle in Tahlequah this weekend. This Sunday, I dropped my son off at Hale Boy Scout Reservation in Talihina, Oklahoma. Since he didn't have to be there until 1pm, I decided to sneak in a paddling trip on the Lower Mt. Fork River in Broken Bow, Oklahoma. These days, I rarely find an opportunity to break out the Sprayskirt and ride the current. The LMF is typically the only whitewater paddling to be found in the Oklahoma summertime. Don't be surprised if you AT&T phone doesn't work anywhere in Broken Bow, mind didn't. Luckily Ambush Adventures is right at the take-out and they shuttled me and my boat back to the put-in for a mere five dollars! While my Wife & Son slept in, I hit the LMF River at about 6:30am and practically had the river to myself for a few hours of pure serenity. At this time of day on the Lower Mt Fork, the river is misty and quiet. The herons hold court as the morning light slowly changes from gray to green to golden. As the sky cleared, the heat & humidity rose too late to spoil a perfect morning of paddling. More of our LMF kayaking pictures in this Flickr photoset. The water flow was nice at around 35-400 cfs, so the Rock Garden section was a bit bumpy, but loaded with great eddys to 'park' the kayak in and take pictures. The narrow bit before the falls is the most exciting part of the paddling. The current is strong here and the rocks and snags are many. However, if you go with the flow and only use your paddle to keep your bow pointed downriver and to brace when you bump something, you should get through it fine. If you want to avoid the falls, you can cut hard to the right at the end of the narrow section. This will allow you to 'park in an eddy' and take pictures or pick the best spot to go over the falls. The one downside of paddling the LMF River so early in the day is that I didn't get to photograph the usual fleet of strangers picking their own way down the three-foot Presbyterian Falls. You can capture some very honest emotion on the faces of folks when that ice cold water hits them in the lap as the go over Presb. Falls. On my way home, at the end of my latest Mt. Fork River float trip, I saw loads of people lining up to enjoy the ride. I think Broken Bow offers the 'most fun four miles in Oklahoma' - Kayaking The Lower Mountain Fork River. Don't miss it this summer. As usual, no kayaking t-shirts were available for purchase. So, I bought myself this kayaking t-shirt online. Also, upon arrival at MicroTel in Broken Bow, OK I was informed that despite my so-called "Reservation" and "Confirmation Number", they were full up. The clerk seemed pretty amused by the whole thing. She had they same wry expression on my previous visit to this very flophouse, where they failed to honor the deal we had reserved online. Luckily, someone built a brand new hotel right next door. I did not waste more than a couple minutes in the Microtel and next time I will waste even less. If you have ever visited our Kayak Texas page then you know I have long wanted to visit Caddo Lake. Caddo is an old, natural lake that is more like an elaborate river system than a lake. It flows down from the Big Cypress Bayou in a series of interconnected fish laden, tree-lined canals, ditches, ponds and shallow lakes. This lake offers more shade than any other body of water I have ever seen. We just got back from a two night stay on Caddo Lake. We did a little bit of fishing, a whole lot of kayaking and we even shelled out the doe for a guided boat tour. 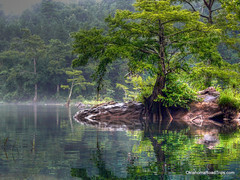 If you enjoy the Cypress trees on the Lower Mountain Fork River in Broken Bow, Oklahoma, visit Caddo Lake soon. This shade-tree paddler was in flatwater heaven. Normally, Dianne and I won't consider spending our outdoor time enduring the noise and odor of a motor boat. It is one thing to watch them pass by, but being out the water without hearing the birds holds little charm for me. However, Caddo Lake is vast and varied and our time was short. We decided to take the one-hour lake tour at the last minute. To my shock, Billy Carter's Go-Devil® Tours was the highlight of our trip to Caddo Lake. I wish we had taken it earlier in our trip and I will definitely take the tour again upon our return to Caddo Lake. The river guide was able to show us the oldest most scenic areas in this ancient flooded forest. Caddo Lake is an ancient flooded forest of Bald Cypress trees. The huge water trees are 'curtained' with thick garlands of Spanish Moss that capture moisture from the early morning air. As the moisture evaporates, it has a cooling effect. The tea-colored waters are teaming with unusually large Catfish, Bass, Sunfish and Crappie. Lily pads abound on the Caddo. Lovely white water lilies and bright yellow Lotus border small tree lines in some places and fill lakes in other area. On Caddo Lake you can paddle your kayak into a 'field' of thousands of water lily blooms. Caddo Lake is paradise for fishermen and photographers. We spent our two fabulous nights at Caddo Lake Lodge, in the small town of Uncertain Texas. The Wells family was nice enough to offer us a discounted 'press' rate to facilitate of first trip to this paddler's paradise. The lodge offered plenty of room for Dianne and I plus our son Dylan and Dianne's mother. The house has ceiling fans everywhere, cold A/C, a large, deep, soaking tub, spacious deck and other luxuries. The large dining room was great at mealtime. The Caddo Lake Lodge website has pictures of the rooms, but my favorite feature was the private canoe launch and fishing docks. The height of luxury in the perfect location. The dock is located on a narrow section of Caddo Lake called Clinton's Chute. We paddled our kayaks a short ways down to an even more narrow and shady branch called Clinton's Ditch. This part is too narrow and shallow to appeal to the speeding Bass boats. The mix of land and water on Caddo Lake is unusual. It allows you to slip silently through the forest in your kayak. 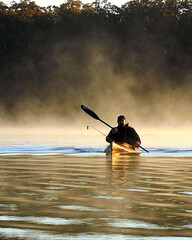 Paddle quietly and you are sure to sneak right up on a wide assortment of interesting wildlife. Such a wealth of trees is of course ideal for Dianne because she loves to set and run limb lines for Catfish and Bass. For the photopaddler, Caddo Lake offers filtered light on the brightest of days, loads of reflections and a unique blend of light and shadow that is like nothing I have ever seen before. Taking the guided tour earlier in our trip would have improved my photopaddling success as the guide took us to see several more ditches through the bayou. On future trips I hope to launch from a few different boat ramps to see more sections of this amazing lake. I expected the swampy bayous of Caddo Lake to be stinky and crawling with snakes. I surprised to find neither was the case. I only saw one snake the entire time I was in the area and it was being carried away by a hawk at the time! The smell of Caddo Lake was lovely during the hot, muggy season we visited. I have never spent so much time on the water and still avoided sunburn. Dianne and I both bought short-term fishing licenses, but as usual Dianne did all of the fishing, I was too busy exploring the boat lanes, duck blinds and 'bayou architecture'. It is like the Lower Mountain Fork River, but with much larger Cypress and much flatter water. Neither Dianne nor I have ever found a spot that was so ideal for limb lining. The large amount of cover on Caddo Lake allows the fish the time to grow enormous and there is always a handy limb to set a hook. The trees are often surrounded by very deep water, which is excellent for fishing or very shallow water which is excellent for catching bait. Catching limb line bait just takes a Minnow Trap, Seine or a few minutes with the casting net. You can also buy bait at a number of places like: Jonhson's Ranch, Crip's Camp and other fine local establishments. Dianne had no trouble catching a whopper Bass at Caddo Lake, but it takes a mighty big one to get the record...over 16 lbs the last I heard! Uncertain, Texas is a very economical travel destination for any Oklahoma paddler who is eager to explore water trails that have more in common with a rain forest than with the Great Plains. Check out Caddo Lake photoset on Flickr to see more of our pictures from this great road trip. Early Summer is a great time for fishing in the Deep Fork River. Dianne and I met up with our friend Greg for some excellent kayak fishing action this weekend. Dianne and Greg ran the limb lines with strong results from Friday evening through Sunday. I chased them around with my camera and tried to stay in the shade as best I could. Limb lining is one of the most effective ways to catch catfish using a kayak. They like to lay in deep muddy holes in the riverbanks on Deep Fork, but they will come out of their holes for a small perch or goldfish dangling seductively from a tree limb. Blue catfish, Channel Cats and Flatheads grow very large in the Deep Fork River, so choose your hooks accordingly. You can also expect to see quite a bit of action from Aligator Gar, a toothy prehistoric fish that is best handled with fish handling gloves and much caution. This weekend the fish and birds were very active due to large clouds of Mayflies in the air and covering nearly every leaf on many trees. Once mayflies have molted, they usually gather in swarms over the river to mate. The Mayfly (AKA Ephemeroptera) is considered to be among the first group of organisms to have ever taken flight. That is no surprise to me, since the Mayfly normally only lives for one day...it requires the extra speed of air travel. It was an epic weekend, we even stapped the lights on our kayaks and did some night kayak fishing. I heartily reccomend it if you like the taste of insects. Dianne and Greg both caught the biggest catfish they had ever hauled into their kayaks...several times. I got some great pictures and had a ball watching the action. You can check out a few of the pictures that I felt were not too bloody to upload on my Flickr page at: http://www.flickr.com/photos/freewine. Remind me to give you Dianne's fantastic recipe for pan-fried catfish fillets sometime. See you on the water! Update 6-19-2010 - Check out the new Kayak Fishing page at OklahomaRoadTrips.com for all the details on limblining for Catfish in the Deep Fork River. With Father's Day Weekend right around the corner, Oklahoma's Summer heatwave has kicked in right on time. Float trips on the Illinois River, The Elk River and other area waterways are way up. Fishing season is in full swing whether you are pursuing Bass, Catfish or Crappie. Dianne is catching fish everywhere she wets a line these days. My kayak fisherman friend Scott reports that the Gar are up on Spavinaw. I am glad Summer is here! The Father's Day holiday has long been a favorite of mine since it usually means Dianne will agree to going paddling in Broken Bow, Oklahoma. I haven't taken a trip down the Lower Mountain Fork River in far too long! Since we have a Texas kayaking trip to Caddo Lake planned this Summer, I may not be able to get a 'haul-pass' to the LMF anytime soon. BTW, I just added a new outfitter for the LMF River page: Broken Bow Canoes (that name sounds a bit grim, eh?). Check them out sometime and let me know what you think: www.brokenbowcanoes.com. In Northeastern Oklahoma, The Spring River levels have been looking quite good lately. Of course, there are no outfitters working on Oklahoma's Spring River, so plan to self-shuttle if you make the trip. I think it is a lovely river offering an easy Class I paddle from Baxter Springs KS down to Quapaw, OK.
FYI - Fleet Feet Sports in Tulsa, Oklahoma is seeking kayaker volunteers for The Tulsa Triathlon on Skiatook Lake (out in the water in case a swimmer falters). Sunday June 13, 2010 at 7 am. Loads of local folks are gathering up at the usual spots on the Deep Fork River. This time of year, when the Deep Fork River rises it brings white catfish in addition to water. These white catfish are said to merely be blue cats that have altered pigment due to the stained water. My Dad claims they are tastier than other catfish and I am inclined to believe him. He has hung a tooth on many a catfish. Dianne has been catching them off limb lines from her Old Town Vapor Kayak (Pics on Flickr). The Deep Fork River makes a good fishing line spot for us because it is close to home. Limb lines are a great way to catch catfish, but you have to 'run' them every four hours or so to harvest fish and or re-bait your lines. Our new Kayak Fishing page has all of the details to get your started limb lining for catfish in your kayak. Watch your fingers during this type of fishing, Dianne caught a rather large Gar today. Gar have teeth like a dog and are much more risky to handle than catfish. Most folks use a thick leather glove to protect their hands from gar teeth. Dianne also uses a lip grip gaf to help keep her prey under control while kayak fishing. I had a three-day weekend scheduled and the weather forecast suggested I spend every day of it indoors. I am glad I ignored the weatherman. I went mushroom hunting in several spots and paddled both Grave Creek and Deep Fork. Spring is usually short in Oklahoma, don't let it go to waste! It is kayak buying season. Bass Pro Shops has Old Town Rush kayaks for $299 each and that is a pretty sweet deal. OKC Kayaks is churning out the new kayakers with their social paddles, swamp paddling trips and blemished kayak bargains. Even my buddy Yakker got himself a new fourteen foot sit-inside kayak. I prefer ten foot kayaks for my sunset chasing, but Dianne is finding her twelve foot Vapor to be an excellent platform for fishing. Get yourself a kayak and hit the water! The Illinois River in Tahlequah, OK has been flowing at a consistently excellent level for weeks. 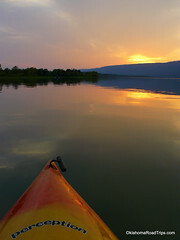 This is the perfect time of year to enjoy some kayaking in Tahlequah, Broken Bow or the waters of Arkansas and Missouri. As a purely recreational kayaker that rarely travels more than an hour or two away from home, kayaking should be a very inexpensive sport for me. Surprisingly enough, my passion for this fantastic sport has driven me to spend a small fortune on my paddling. There is no end to how much money you can spend on paddling...and it is worth every dime! Here are some help you keep your kayaking affordable. Discover what aspect of paddling truly drives your passion. Although I did some canoeing as a child, when I tried it again decades later I instantly fell in love with paddling. My wife and I made a short day trip down the Illinois River in a rented canoe one early summer day and I suddenly felt like I knew how I wanted to spend my weekends for the rest of my life. After renting canoes on only two rivers, Dianne and I realized that neither of us cared for sitting in the front of the canoe. We both wanted to drive. Kayaks proved to be the ticket for putting us both in the driver's seat of a much quicker craft. With many rivers now under our belts, Dianne and I have learned that there are countless things to enjoy about float trips. We love seeing the lush scenery and wildlife, getting outdoors and seeing our neighborhood waterways from a different perspective. I am endlessly amused with the anticipation of wondering what lies around the next bend in the river. Kayak photography has also become something of an obsession for me and Dianne spends more and more time kayak fishing every year. The fairly easy whitewater rapids on the Mulberry River and the Mt. Fork River offer a thrilling change of pace that is down right addictive. Even the simple workout that comes from paddling across the lake chasing a good sunset is reason enough for me to own a kayak. Decide what kind of paddling excites you most and it will help guide your purchasing choices. So far, I have purchased three plastic kayaks, one plastic canoe and one cheap inflatable kayak. Every boat I buy teaches me something different about paddling and about myself. The Wal-Mart inflatable kayak (I forget the brand) cost less than $100. It taught me how important it is for me to have a boat that is quickly ready to get on the water. An inflatable kayak takes two viagra and twenty minutes of sweet-talking to get ready. It did not fit the busy schedule my day job forces me into and it tracked very poorly. We paddled it once or twice and then banished it to the nether reaches of our garage as future yard-sale fodder. 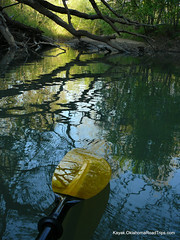 When the plastic Bayou canoe arrived, I was surprised to learn that it weighed in at a far-from-lean 70+ lbs... unloaded! At around $700, it is one of our most costly boats, but it rarely sees water. Canoes make great cargo vehicles on the river, but they can be overkill if all you want to do is enjoy a few hours exploring the local reservoir. All three of our plastic kayaks are Sit-Inside-Kayaks (SINK's). We rented a few Sit-On-Top Kayaks (SOT's) and found that the most affordable SOT kayaks keep you sitting in a small pool of water much of the time. Although they are unsinkable, it is just as easy to fall off a SOT as it is take-on-water in a SINK. Since we like to paddle a bit during the winter and in waters that are less-than-pristine, a Sit-Inside Kayak is the only way to go for our floating adventures. You can check out the wide range of kayaks available and do some price checking here: Kayaks for Sale. When the first plastic kayak we ever purchased started to get a bit leaky, Dianne decided that she wanted to try out a longer boat. In the recreational kayaking world, fourteen feet long is HUGE and most Rec Kayaks come in at around ten feet long. Like most longer kayaks, Dianne's Old Town Vapor Sit-Inside Kayak promised more weight capacity, faster speed and better performance in wavy conditions. Adding length at the waterline, almost always has those impacts on performance and the 12' Vapor is no different. What they don't tell you in the ads is that longer kayaks are more difficult to load and carry off the water and slower to turn when on the water. The slow turning is an issue for me. I enjoy throwing the kayaks in the back of the pickup and heading for the put-in fast and Idon't want to ask anyone for help. Either Dianne or I can get Dianne's twelve foot long Vapor in and out of the back of the truck, but it is more difficult and it would not work at all with a longer kayak. You can also count on paying around a hundred dollars per extra foot of kayak length above 10 feet long. On the Sea, bigger boats payoff more, but I often paddle creeks where I can reach out and touch both river banks! A longer, faster kayak is also bound to weigh you down more, especially when strapping to the roof racks on a car or SUV. Most folks who paddle longer kayaks tend to roof rack them. Folks that are new to the practice are often surprised to learn that their roof racks require some additional investment in bracing and tie-downs that can end up costing as much or more than an entire boat trailer! You can't have much fun with your kayak, if you can't get it to the water. Make sure you have a boat transportation plan before choosing your kayak. For most folks the choices are: roof rack, pickup truck bed, toy hauler RV or boat trailer. Believe it or not I spent of a lot of time worried about my kayak getting stolen. Even when we were sharing a single $400 plastic boat, I wondered how those big bass boat owners slept at night. To my knowledge, no person ever tried to swipe any of our kayaks. However, a bit of change and a cheap padlock improved my ability to sleep at night (cable locks work good, too). After paddling waters all over the Ozarks, I can tell you that most people we pass tell us that we are 'working too hard'. I don't think our cheap plastic boats are hugely at risk! A much bigger security issue is how you secure your gear on the river. Dry bag your gear and tie it to the boat. You can even find small dry bags and pelican boxes for your cell phone & GPS. Keep your wallet bagged or leave it at home. No glass containers on the river. Riverside cabins offer the nicest way to enjoy a few days of paddling, if you have the loot. Tent camping can be a lot of fun too, but if sleeping on rocks turns your gal off the desire to hit the river...you failed. Motels offer a cheap alternative to get lodging that is closer to the water than home and they are much cheaper than river cabins. If you have old bones like ours, you might prefer the comfort of Trailer Camping aka 'Tramping'. We bought a toyhauler RV to help me and Dianne get a good night's sleep and still get on the water, while the light was good. It wasn't long after that until we were shopping for a river lot to keep the toyhauler parked on. As I said, there is no end to how much money you can spend on paddling. Just make sure the spending doesn't start to interfere with your time on the river! A warm Spring day like today deserves a good paddling, so I woke up early and visted a new section of an old favorite flatwater paddling spot in McIntosh County. Grave Creek is a small feeder creek that eventually ends at Lake Eufaula. The creek is narrow, curvy and usually pretty shallow. The deepest section of Grave Creek offers a boat ramp right off Highway 266 a mile or so above the lake. The boat ramp is popular with fishermen and can be pretty crowded these days. This morning, I used a more primitive access to the creek North of the boat ramp off Highway 266. It was very secluded. I saw many creatures but no people. Clearly, I wasn't the first one there because there was litter and even some old chopped up vehicle in the creek. With another six inches of water it would be much better kayaking. Still, it was peaceful and lovely and the weather was great. You can paddle on both sides of the road, if you can find the old dirt road outside of Hitchita, OK that crosses Grave Creek. Heck, I even paddled through a steel pipe to enjoy the short drop off the other side! The best way to find this creek access, is actually to take Cedar Road, right off of Highway 52 between Morris, Oklahoma and the junction of Highway 266. Follow Cedar East a couple miles until the pavement ends and then a bit farther up the dirt road until it crosses Grave Creek at a crude concrete and steel pipe bridge. It became quite windy later in the day, so I am glad I got out early in the morning. However, this part of the creek offers high banks that shelter you from the wind better than most Oklahoma kayaking spots I know. More pictures on our Grave Creek page at OklahomaRoadTrips.com. Perfect paddling weather is currently forecast for Oklahoma this weekend! The Spring rains have many local waterways up and running but few, if any, are flooded. Since my buddy Yakker has just purchased a new 14 foot sit inside fishing kayak from Wilderness Systems, I know he will be wanting to get out on the water. You should, too! The redbuds are in full bloom and the dogwood trees won't be far behind. The area's most scenic rivers for paddling are at great water flow levels this week. It looks like good paddling conditions on: the Buffalo River, The Illinois River, The Ouachita, the Mt. Fork River, the Caddo River, the Kings River and on Big Piney Creek. Plus whitewater kayaking favorites like: the Glover River, the Cossatot, the Poteau River, the Saline and the Mulberry River are all running at fun levels for playboat adventure. Sunday, I am hoping to make another trip to Grave Creek. I went hunting for morel mushrooms this week with my dad and on the way home he showed me another spot to access Grave Creek that is upwards of the Boat ramp most folks use to access Lake Eufaula via Grave Creek. I'm hoping to plot out a good one way kayaking trip on Grave Creek, so i can invite the Oklahoma Flatwater Paddlers down this way for a group paddling trip. BTW, if you decide to hit Grave Creek at the boat ramp this weekend, expect a crowd. The crappie are running, so many fishermen are launching there and driving down to the confluence with the lake. It looks like they are really catching them, too! In other local Oklahoma paddling news, OKC paddlers have an excellent chance to have some fun in the OKC area and do somehing noble for their community at the same time. The Fifth Annual Stinchcomb Wildlife Refuge & Lake Overholser Cleanup will be held in northwest Oklahoma City on Saturday, April 24, 2010. The event will take place from 8:30 a.m. to 1 p.m. Meet at the pavillion near the Lake Overholser Dam tennis courts to check in and get trash bags. (near NW 39th and Council—visit the http://www.okckayak.com for launch map links, Google Earth maps and detailed directions). Please RSVP no later than April 20 by calling Rodney Boegel 405.802.3678 for more information and to reserve your free kayak, lifejacket, and paddle... generously provided by OKC Kayak. 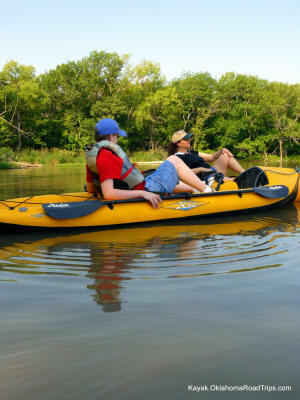 OKC Kayak will even give you a mini safety & how-to briefing prior to putting you in a boat. Tell them Kayak Oklahoma sent you! Spring is one of the best seasons to enjoy nature while taking a float trip on an Oklahoma river, so don't misss out! See you on the water! Spring has sprung and the temps are warm. 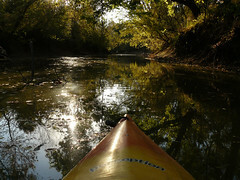 In addition to the weather and the scenery changing, the Kayak Oklahoma Blog is changing too. The Blogger-required migration from the old blog address of http://www.oklahomaroadtrips.com/paddle.htm to the new URL of http://kayak.oklahomaroadtrips.com/ did not go completely without hickups...however it seems to be working now. Please let me know if you have any problems with the webpage or news feed after you have updated your own bookmarks and subscriptions. Recent rains have many Oklahoma area rivers running and great levels for canoe and kayak trips. As of today, you can find great water levels on the following area rivers: the Illinois River, the Caddo River, the Upper Mt. Fork River, the Lower Mt. Fork River, and the Glover River in Oklahoma, plus the Upper Buffalo River, the Kings River and the White River in Arkansas. Check the main OklahomaRoadTrips.com site for details on these rivers. To paraphrase the folks at Blogger.com - embrace the changing season for you surely cannot stop it from occuring! Got a comment on the recent changes, hit the new site and leave us a comment. We may not have to sunset this blog after all! This blog is now located at http://kayak.oklahomaroadtrips.com/. It looks like the Kayak Oklahoma Blog may be soon coming to an end. The folks at Blogger.com have decided to end support for authors who own their own domain. Although it is kind of a bummer that they are dropping this service right at the start of Spring kayaking season, I hope it will open up more time for paddling. Still, OklahomaRoadTrips.com will continue. Dianne and I are still eagerly paddling all of the local waterways that we can manage, so you can expect to find float trip reports and kayaking photography on this site...just not on this page. This Summer we are heading south to visit a cabin on Caddo Lake in Texas. We are also planning a trip on the Caddo River and the Ouachita River in Arkansas. As usual we will hit our two favorite Oklahoma rivers: The Lower Mountain Fork River in Broken Bow, Oklahoma and the Illinois River in Tahlequah, Oklahoma. Also, keep an eye on our site to get the details of Dianne's kayak fishing exploits as she goes after Gar, one of Oklahoma's largest and oldest fish species. For late breaking news on Oklahoma kayaking issues, look me up on Twitter (username: FreeWine) and if you want to contact me you can always email me or hit me up on Flickr or Facebook. Until then, I hope to see you on the water!